It’s not often you come across a restaurant named after a piece of classical music, but there’s one in Paris which has a particular claim to fame. The story began when the French composer Darius Milhaud (MEE-oh) was working in Brazil from 1917 to 1919 not as a musician as you might expect, but as secretary to the French Ambassador to Brazil, Paul Claudel who also happened to be an eminent poet and dramatist. They collaborated for several years and Milhaud set many of Claudel’s poems to music. Milhaud was captivated by the vibrant popular music of Brazil and especially with a popular tango entitled in Portuguese O Boi no Telhado, which the composer translated as Le Bœuf sur le Toit. 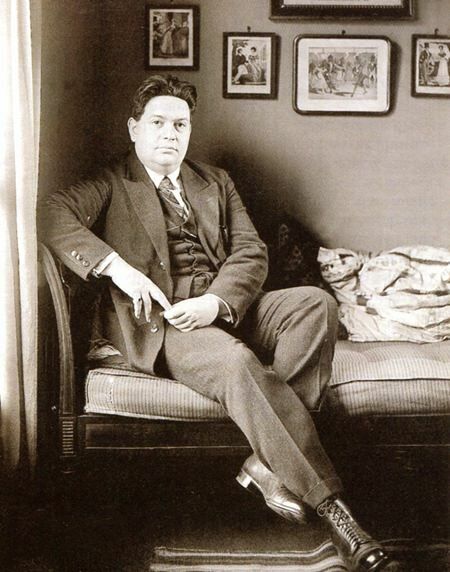 Returning to Paris in 1919, Milhaud wrote the score for a surrealist comical ballet of the same name, using Brazilian popular songs and dances. This was the beginning of the Roaring Twenties, known in France as the années folles , when Paris was probably the most influential and insatiable cultural centre in the world. Milhaud and his composer friends had earlier formed a group called Les Six, the most-well known being Arthur Honegger, Francis Poulenc and of course Milhaud himself. They met at a popular artists’ bar called La Gaya in rue Duphot, which connects rue Saint Honoré with the majestic Boulevard des Capucines. The presence of Milhaud, Cocteau and their intellectual entourage made La Gaya immensely popular and in 1921 when the bar relocated, the owner renamed it Le Bœuf sur le toit, presumably to ensure that Milhaud and his crowd would continue to patronize it. And patronize it they did, together with dozens of other distinguished customers and hangers-on. Anyone who was anyone showed up there at some point, including Coco Chanel, Charlie Chaplin, Maurice Chevalier, Jean Cocteau, Ernest Hemmingway (of course) and Igor Stravinsky. From the day it opened, Le Boeuf was the epicenter of cultural Paris. Not surprisingly, most people erroneously assumed that the ballet, which had become hugely popular, was named after the bar, not the other way around. This exuberant, unbridled music is almost a sound-picture of The Roaring Twenties and will brighten the greyest of days. You get the impression of a selection of scenes pasted together like the contents of a scrapbook and this is partly where its charm lies. Much of Milhaud’s music is influenced by jazz and popular song, and he often used a technique known as polytonality, in which parts of the music are written in more than one key simultaneously to create a vaguely bizarre effect. You can hear an example at 00:31, near the beginning of the piece when the flutes are clearly playing in a different key to the rest of the orchestra. The work was first performed at the Théâtre des Champs-Élysées in February 1920 with a scenario by Jean Cocteau and stage designs by Raoul Dufy. The ballet is set in a bar and instead of a story-line consists of a sequence of scenes featuring a troupe of slightly surreal characters. Incidentally, Milhaud was also a composition teacher and one of his students included the songwriter Burt Bacharach, to whom Milhaud once said, “Don’t be afraid of writing something people can remember and whistle.” Bacharach later wrote well over a hundred hits, so it must have been good advice. The Sinfonietta was a commission from the BBC in 1947 and was first performed in London the following year. The colourful music is light and dance-like, sometimes whimsical, sometimes haunting and sometimes pure Hollywood. Like Le Boeuf, it’s full of rapid scene-changes and musical surprises but a little more restrained and more reflective. Although there are echoes of the Twenties, by 1947 the world had become a different place. Francis Poulenc was another of the regulars at Le Bœuf sur le toit. From the age of fourteen, he knew he was going to be a composer and during the war years he got to know Darius Milhaud, Georges Auric and Erik Satie. He was largely self-taught but has been described as one of the great melody-writers of the twentieth century. Listening to this most charming and approachable of works, you’d never guess that throughout his life, Poulenc was plagued with periods of manic-depression, nowadays described as bipolar disorder. Oh, and in case you’re wondering, Le Bœuf sur le Toit still exists in Paris, in the form of an ultra-chic restaurant which has jazz evenings every Friday and Saturday. It’s at 34 rue du Colisée, near the Champs Élysées. Reservations are essential of course. Don’t forget your credit card.